I remember having this beer for the first time a little over 10 plus years ago. I had become addicted to Chimay Blue and my quest for great Belgian beer was on. This is way overdue. The white bottle, the pink elephant, how can one not be enamored by the sexiness of this? The magnetic draw this bottle produces just screams “reach out andtake me home, I’ll make you appreciate good beer.” Tease, tease this here bottle is… How can you turn her down? I remember having this beer for the first time a little over 10 plus years ago. I had become addicted to Chimay Blue and my quest for great Belgian beer was on. I discovered this beaut at a great little uppity food market and wine shop in Sacramento. I remember it so vividly; the taste was crisp and a little zestier than anything that I ever had. It was like a Champaign version of Chimay. At least that’s what I envisioned back then. This beer has ever since been in my fridge, always there like a best friend on every special occasion that comes up. My little pink elephant, I raise my glass as a toast to you! The beer poured a beautiful golden yellow. Nice thick head that holds its retention with dancing heavy carbonation bubbling below. The smell hit me with citrus, a bit of banana and a nice yeasty floral fragrance. The first taste brings me back. The mouth feel is creamy, which has the citrus and carbonation riding through, then the yeasty mustiness comes in along with some sourness. The carbonation takes over and leaves a nice dry finish. The taste is complex and gets better as you drink. Tasting different notes as it warms. Wow. This beer is in every word, an extremely “drinkable” beer. Goes down easy and satisfies that deep “good beer quality” thirst you yearn for AND deserve. Summing this up. Highly recommended and will not disappoint. I’m kinda wondering about the content of the glass. 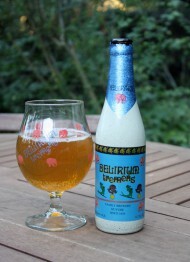 The bottle says Delirum Tremens, but that’s clearly not what’s in the glass? Thanks for the email. I uploaded wrong image and replaced with correct! I appreciate the note! !